You love your Galaxy smartphone. Now enjoy the same Galaxy experience on a tablet. You’re already a Galaxy Tab 3 expert. Getting started on a Galaxy Tab 3 is a breeze. Comfortably switch back and forth from your Galaxy phone to your Galaxy Tab whenever. Your content is automatically in sync—wireless, fast and for free. 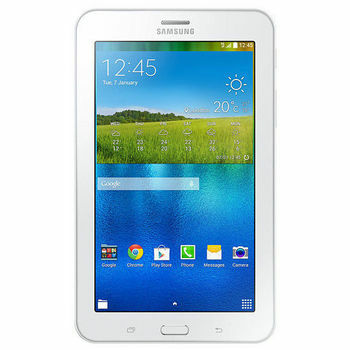 Galaxy Tab 3 Features The Samsung Galaxy Tab 3 is packed with features designed to give you a chance to relax, to connect and engage with family, to keep you entertained, and to offer new conveniences in everyday life. It works a lot like your Galaxy smartphone, so there’s nothing new to learn. Just start having fun. The Same Galaxy Experience You love your Galaxy smartphone. Now enjoy the same Galaxy experience on a tablet. You’re already a Galaxy Tab 3 expert. Getting started on a Galaxy Tab 3 is a breeze. Comfortably switch back and forth from your Galaxy phone to your Galaxy Tab whenever. Your content is automatically in sync—wireless, fast and for free. A Powerful Tablet Enjoy your favorite tablet apps and activities on the Galaxy Tab 3. Search, explore, and buy online with fast web-browsing. Stay connected with friends wherever you are. Download apps, catch up on email, and more. It’s fun and easy for the whole family.